The past few days all of these things happened. We planned a family morning out to a local farm for a tractor ride and pumpkin picking. We did this last year and the girls really enjoyed it. So we forked out the £21.50 again to do this, but it was will probably be our last time because it's simply not worth the money. I LOVE pumpkins, though, so this is somewhat meaningful to me. So the cost of the tractor ride and pumpkins fit in our budget, as this is the only family "fun" we have planned for the rest of the month. 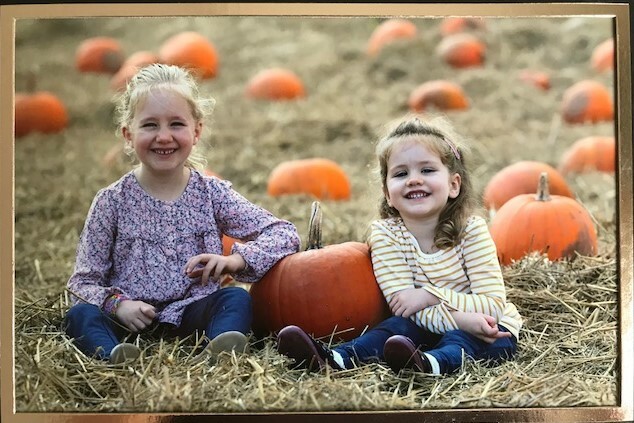 However, the £8 spent on the picture above, taken by a photographer running around the pumpkin patch, was not budgeted for... but aren't my pumpkins so darn cute?! Then there was the "snack" that I swore up and down before we left the house that morning that we wouldn't be buying any snacks or taking any snacks with us because my kids didn't eat much for breakfast that I went ahead and bought. My kids were hungry and smell of the sausages being grilled at the farm shop were seriously luring... and then I uncharacteristically said "yes" to a coffee when the lady asked if I wanted a cup with the sausages. Ka-ching! There went another £9.50 for a snack we could have avoided and didn't really need. I added these extra costs to my budget, but it leaves very little wiggle room for the second half of the month. Saturday evening, my husband and I got dolled up for an evening wedding reception. In case anyone couldn't tell... I didn't buy anything new to wear. I am not gifted with any sort of fashion sense! I am blessed by super friends who babysit the girls for a few hours every once in a while for nothing but a hug in exchange, one of whom babysat the girls for us that evening. Of course I'd happily babysit their children when the need arises, too. Unfortunately, though, just as we started the car... thankfully it started just fine... we immediately noticed the dash didn't light up and the speedometer didn't work. Oh boy. Again, we are super blessed to have a fantastic mechanic (although he's about 25 minutes away) who was able to fit in our car today. Thankfully, the cause of the panel not working was due to a fault in the software which he was able to fix and no expensive parts were required. Yay! This £35 fix was unexpected, though, and put us "in the red" for the time being in the "Vehicle Servicing" category of our budget. Grrr... and with a MOT (saved for on a monthly basis) and a major service expected in December, we will have to save more than we usually do in November and December to pay for this. I also forgot to account for a wedding gift for the bride and groom whose reception we attended. It was a small financial gift, because the groom is my husband's colleague and we have never met his wife, but still it put our budget "in the red" in the "Gifts for Others" category on our budget. Again, we can re-coop this cost in November, but I really don't like overspending then having to play catch up. On Sunday a dear friend at church gave me a surprise bag of goodies of surplus goodies she had in her kitchen, as seen in the picture above. I was absolutely delighted - think two school girls giggling in class - with a jar of raspberry jam, whole nutmeg (I think I'll pass on a few of these to my friends) and a jar of good-quality cocoa powder. This friend also brought in two boxes of Bramley apples from her garden to share with the church, so I also gratefully helped myself to 4 of those (after others helped themselves first, of course). My husband would like me to make an apple pie with these apples and I'd like to try to make homemade apple cider vinegar from the apple peels following the recipe the same friend told me about last week. I wish I had taken a picture of the large pot of chicken "noodle" soup I whipped up on Sunday, but I didn't think it would turn out as delicious as it had. I bought two medium-sized whole chickens from the farm shop on Saturday for £7. Wow, £3.50 each for great-quality chickens. After our roast chicken dinner on Sunday, there was just enough chicken leftover to add to a pot of soup. I have never made chicken noodle soup before, but, hey, how hard could it be, right? I sauteed some onion and celery in a bit of the chicken fat and the burnt bits on the bottom of the Dutch oven from the roast chicken. Since Aldi didn't have a bag of carrots (can you believe it?!) I used some mixed vegetables in the soup instead. I also was able to use up a jar of homemade vegetable stock another friend gifted me a few months ago (she was a recipient of some of my homemade vanilla extract). A bag of giant couscous has been sitting in my cupboard for months now, so I decided to finally put them to use in this soup - hence why it's not really chicken noodle soup. I was delighted when my kids ate up this soup this evening for supper - they have never had chicken noodle soup before either. There's even a couple of generous portions left over for tomorrow's lunch. Last but not least, we decided to go ahead and buy our 3-year-old's new big girl bed about a year and a half before we originally planned. Just before our older daughter turned 5 in March, we bought her a big girl bed, but since then, our younger daughter has also been wanting her big girl bed, claiming that her toddler bed is uncomfortable. We have waited a few months to buy her bed but went ahead and made the move last week. We did our research and my husband found out that we could save almost 50% on beds through his company's discount website. Maybe we should have waited another month or two to bulk up the "Home Expenditures" section of our budget because now we're slightly overspent in this category, too. Any other plans we have for the house will have to be put on hold another 6 or so months until we can save up for the next big purchase. The reason I'm sharing this is to prove that in no way am I anywhere near perfect in my spending or money-saving mindset. I'm still learning from mistakes and struggle with needs versus wants. But there are also so many ways to find pennies in everyday life and to focus on contentment and the many blessings in our lives.